8/16-22 ~ Beliefs Are Tested! 9/2-4 ~ Too Hot? Find the Kool Winter Stars! Note: For those living in San Francisco this New Moon takes place below the western horizon 1 minute after sunset. The Sun and New Moon are in the same constellation for other parts of the world; this constellation, in differing time zones, lies in a different location above or below the horizon. 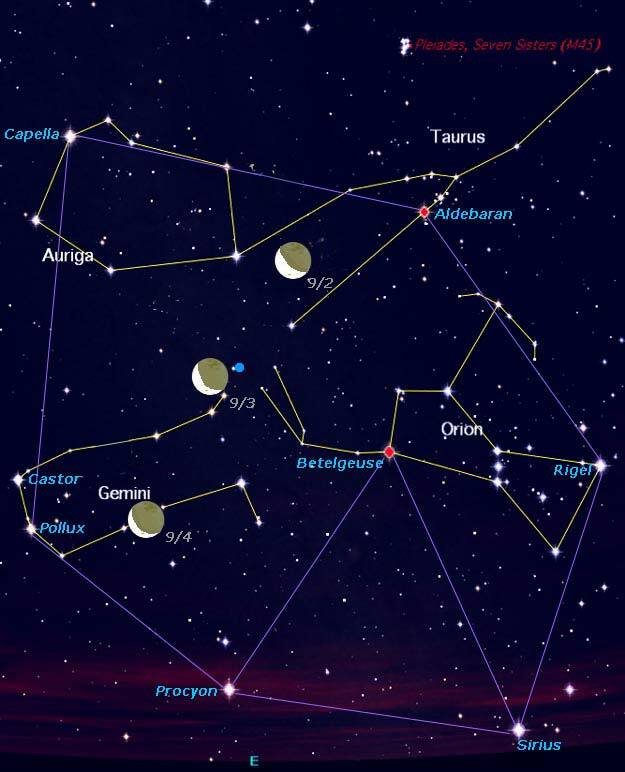 The New Moon aligns with Talitha of the Great Bear, Acubens of Cancer the Crab and the Zeta star of the Hydra. All these celestial bodies are located in a "near same" longitude. Review the map above. The forefoot of the Great Bear, Talitha (Iota) and Kappa of Ursa Major [Constellation Image], I dub to be the protectress, guardian, and nurturer of humanity. This duo is also the Chinese "High Dignitary." Although minor stars, they should not be taken lightly, as they hold a principal office within the Bear. Of the Great Bear they are associated with the global scene and world powers. They inspire us to become a caring and nurturing force for each other, an enabling force that responsibly supports our emergence from darkness, dogma, and delusion, emergence from the limits and bounds created by selfish, fearful or controlling beliefs, a force that supports us to move into freedom and greater personal fulfillment. Cancer the Crab can be thought of as the Egyptian Scarab, the beetle that rises out of its dung into the light of day, similar to the lotus that rises out of the mud. The scarab's claw is Alpha Cancer, Acubens, which conjoins Zeta, the eastern star of the Hydra's head. Review the map above. ... Acubens, the claw of the Scarab ... reveals there is a tenacious hold and stubborn resistance to release the beliefs we hold that keep us entrapped in our limiting life scenarios. These can be the current political / religious beliefs of the times, as well as those ideas we have about our lives and the experiences we have in our lives. This lunar cycle is calling us to become conscious of any limiting and binding selfish, fearful or controlling beliefs we might have, those dogmas that keep us separate from others. We must rid ourselves of these if we are to become whole and manifest our divinity. Once the light of the soul is shining we are able to receive the inspiration of the Great Bear and become a caring, nurturing force for each other, a global ambassador able to dissolve differences. Full Moon in Virgo, begins with this New Moon. Overcoming obstacles to the new incoming awareness begins with the waxing Crescent Moon. What was conceived at the New Moon, Giving Up the Beast of our Beliefs ~ Dissolving Differences, (review above) is now in the process of waxing or gestating. August 11, Wednesday, 15-30 minutes after sunset, Mercury lies to the upper right of Luna's very slender Crescent. Review map above. This horizon-hugging duo is difficult to see even with binoculars. If your up for the challenge, bring along those binoculars. In addition you'll need right timing, a clear sky and a site with as much altitude as possible overlooking an unobstructed horizon. Luna and Mercury lie below and are stimulating Leo the Lion's tail star, Denebola the changer. Swift judgment is passed and changes occur when this star whips into action! These celestial bodies are asserting that it's time to wake up to the Higher Law of Spirit and proceed as a Christed One, with vertical integrity and horizontal humanitarian participation in the world. Note: If you miss seeing Luna and Mercury, look for the shifting triangle of blazing Venus and her dimmer companions, Saturn and Mercury. Spica lies to their right. BTW: Begin your search for shooting stars! Look northeast around 11:00pm until dawn for the Perseids, which peak the following night, August 12/13. With a dark sky "look for the Double Cluster and the Andromeda Galaxy, two of the easiest 'faint fuzzies' to spot with your unaided eyes." See Sky & Telescope's Map. August 12-14, Thursday-Saturday, 30 minutes after sunset, look for Luna and the shifting planetary triangle positioned in the constellation of Virgo the Virgin. Luna first lies below Venus, then near Spica, Virgo's brightest star. Review map above and this 8/14 Nightfall Map. The energies of Virgo the Virgin nurture and shield humanity's hidden divinity until spiritual birth can occur on Earth. To understand this is to recognize the fact that each and every one of us is essentially divine. Spica, symbolizing the sacred womb of Virgo the Virgin, accepts and nourishes the seed of Arcturus, the savior avatar. Helpful Star Map This seed of divinity resides in Virgo and therefore within humanity, and when it is fully awakened the human becomes a caring and nurturing force in the world. Arcturus is the bright golden star high in the west after dusk. The Big Dipper can be seen in the northwest; arc from its handle to Arcturus, then spike down to Spica. The Perseid Meteor Shower peaks Thursday night until dawn Friday. Look northeast after 11:00pm. The Perseids are active through 8/22. Witness the shift. Be the shift! Hmmm ... the missing claws have become Libra's razor edged path, which demands a poised equilibrium between spirit and matter. Ponder the Libran Way, a right use of opposites that dissolves our differences. August 16, Monday evening, First Quarter Luna guides us to the head of the sprawling J-shaped Scorpius. Esoterically the territory of this cosmic Scorpion is known as the burning ground. More in the meditative "Reflections" below. August 17, Tuesday evening, a fatter Luna resides near Antares, the fiery heart star of Scorpius. Antares is a red supergiant star approximately 700x the diameter of our Sun! See this image for a visual comparison. Scroll down this link for the size of Earth, the planets, large stars and Antares. You’ve got about another month to see a uniquely summer star, Antares in the constellation Scorpius, in the evening. It is the brightest star near the moon tonight, in the southern sky as night begins. ... By late September, Antares will be tough to spot in the southwestern twilight after sunset. August 18, Wednesday evening, waxing Luna lies above the Scorpion's stinger stars, Shaula and Lesath. August 19, Thursday evening, Luna conjoins Pluto in the realm of Sagittarius the Archer. See meditative "Reflections" below for more. The First Quarter Moon, exact Monday, August 16, at 11:14am PDT (18:14 UT) squares the Sun at a 90-degree angle and brings up a tension, as we struggle for fulfillment. Ideally any obstacles impeding the awareness conceived at the New Moon are overcome at this time. Scorpius influences a turning point in the life of humanity and in the life of the individual human being. It reorients the personality to the life of the Soul and later to initiation and sensitivity to the Divine Plan. When the Moon transits Scorpius, it activates the transformative power within us, the Kundalini Fire of Life. The realm of the cosmic Scorpion is therefore known estoterically as the burning ground. Scorpius is the seat of the coiled serpent power and Antares the serpent itself ready to be enlivened. Opposite Antares in the zodiacal wheel lies Aldebaran, the illuminating eye of Taurus the Bull, the star of enlightenment. Antares wields the Fire of God by its connection to Aldebaran. The waxing Moon and Scorpius are bound to challenge our beliefs and transform our awareness. The cosmic Scorpion has a stinger to insure the evolutionary lessons are learned! Call upon the Fire of Life to set ablaze the beliefs that keep us separate from one another and stand in the way of unity. Sagittarius the Archer is easily identified by its teapot asterism. Constellation Image August 19 Luna lies at the top of the teapot and conjoins the dwarf planet Pluto currently residing above the asterism. Review map above. Note: The night of August 20 Luna lies at the eastern border of Sagittarius (not shown on map). 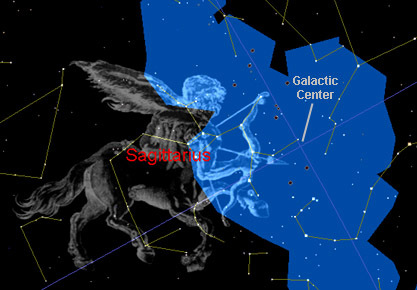 Sagittarius resides where the river of the Milky Way (galactic plane) flows into the ecliptic (plane of our solar system). In fact, his arrow points to the bulging Heart of our Milky Way Galaxy, the Galactic Center. Sagittarius rides toward the light of the inclusive Galactic Heart. This cosmic Archer along with nearby Pluto are impressing humanity to aim for the spiritual vision that includes the “Whole” Truth, dissolves our differences and unites us all. This vision is essential to building a humanitarian world. In addition, the potent energies of the Jupiter Pluto Saturn Crossbow (T-square) peak Monday-Saturday, August 16 through August 21, 2010. Pluto's "crossbow arrow" of death insures that an end comes to whatever is holding back the TRUTH, the soul's unifying and creative expression. As if there wasn't enough going on with Pluto, Saturn, Jupiter and Uranus, Thursday, August 19, we have Venus positioned below Mars forming a shifting sunset triangle with Saturn, all in the constellation Virgo the Virgin. 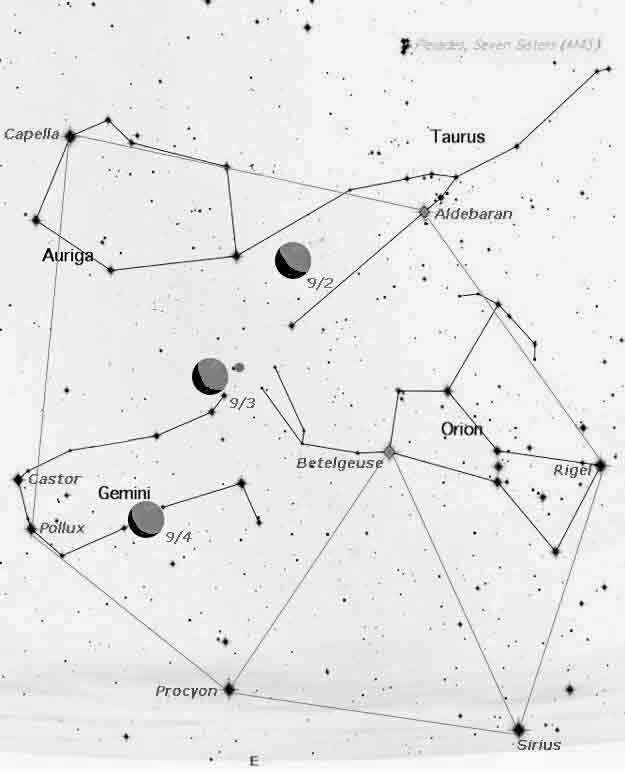 Ponder Virgo's sunset triangle and its affect upon humanity; see sky maps too. Note: Venus and Mars are in exact conjunction Friday, August 20, at 11:49am PDT (18:49 UT). BTW: August 20 Mercury halts its forward motion to begin a retrograde that lasts through September 11. Allow the new incoming energies to break up the old patterns. Hmmm ... Sunday, August 22, the Sun (heart of our solar system) occults Regulus (heart star of Leo the Lion), which focuses and regulates the emanations of Sirius (esoterically the heart of our Sun) toward Earth! Imagine the heart of humanity growing in love as this energy streams forth through our solar system. Whew! Feeling overwhelmed? Take slow deep breaths. Surrender to your Higher Power. Listen for and expect guidance. Dated Circles: These represent the approximate position of the Moon on the given dates at 9:30pm. (180º in 12 hours, horizon to horizon, 180º/12) Stars rise 4 minutes earlier each night. BTW: This map was generated for the evening of 9/24 to show Mars and Venus on the western horizon. These planets set a few minutes earlier each night. The Moon in the vicinity of Jupiter is a visual delight. Look Up! Jupiter and the Moon can be viewed until dawn's early light. 8/27 5:00am Star Chart They lie overhead, high in the south at 3:00am. Generate Star Charts for Your Area. The Great Square of Pegasus rising in the east is the body of Pegasus the Flying Horse. Astronomers look through this "window" to the edge of our galaxy and beyond. 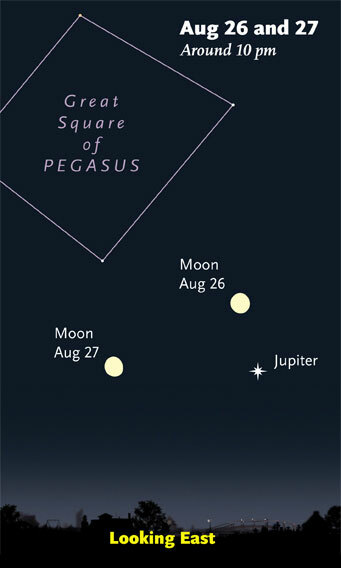 Jupiter now lies south of the Great Square. Fomalhaut rising in the southeast is our southern royal star. The Summer Triangle lies directly overhead at 10:30pm. The Big Dipper guides us to Polaris our North Star, to Arcturus the brightest star in Bootes and from there to Spica the brightest star in Virgo the Virgin. 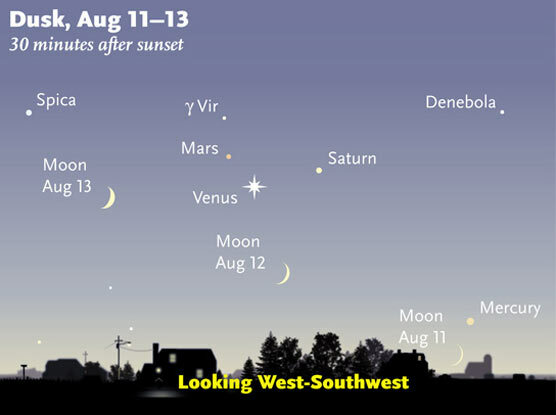 Spica, Venus and Mars form a new sunset triangle. The Milky Way stretches in a dark sky from the southwest, between J-shaped Scorpius and teapot-shaped Sagittarius, to the northeastern, W or M shaped constellation of Cassiopeia. Look through the Summer Triangle to see the Milky Way overhead. View the placement of the Milky Way's river of stars during September evenings. Scorpius our sprawling cosmic Scorpion has a BIG red heart, "missing claws" (now the constellation Libra) and two stinger stars, sometimes called cat's eyes. Use binoculars to see M6 and M7 above the stinger. Track Bunny's Footprints in Scorpius throughout the year! What two stars do the Scorpion, Kitty and Bunny have in common? Find the Teapot east of Scorpius and you find the Archer! Where is his arrow aimed? What was conceived at the New Moon, Giving Up the Beast of our Beliefs ~ Dissolving Differences, review above now comes to fruition and is birthed into the full light of our conscious minds. 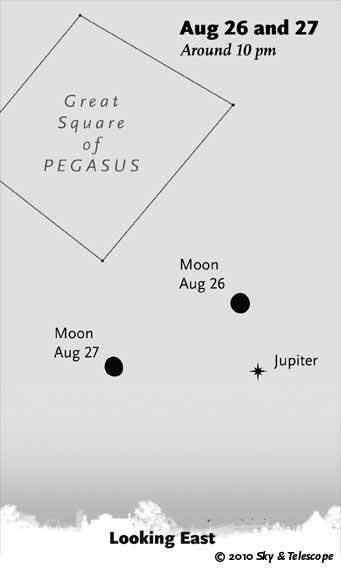 The Full Moon resides in the constellation Aquarius, in conjunction with Enif, the nose star of Pegasus the Flying Horse. The light of Aquarius ever shines within the dark, paving the way for the soul and spirit to express through substance. The healing rays of this constellation cleanse that which must be purified until the dark has gone. The Full Moon during Virgo is illuminated by the Sun positioned near Regulus, the heart of Leo the Lion. Virgo offers an opportunity to intentionally unite spirit and matter. Leo the Lion provides an opportunity to be the soul, which is neither spirit nor matter but the relation between them. Regulus the Royal, Lion-Hearted Lawgiver focuses and regulates the evolutionary energies of Sirius (esoterically the heart of our Sun) in order to stimulate a response in humanity that expresses the Christ consciousness, a response that aligns with the soul's Higher Law. Regulus keeps us vertically attuned for horizontal humanitarian participation in the world (Leo’s opposite Aquarian pole). With the Lion-Hearted Lawgiver near the Sun (heart of our solar system) the heart of humanity grows in the love of the soul as it streams through our solar system and illuminates the Full Moon. With this Full Moon humanity is being called to recognize what is of value, what aligns us with the integrity of the soul, "what moves us" and brings us together in recognition that we're One. This vertical integrity intentionally unites spirit and matter and must precede our horizontal humanatarian participation in the world. We are being called to grow our hearts, to foster humanitarianism, to do what is truly supportive of the greater well being of all. When we can do this the beast no longer lives; differences dissolve. Although they look close together, Jupiter is 1,500 times farther from us than the Moon is when they pass on the 26th and 27th. Note: Catch a sunset on Thursday and Friday, August 26 and 27, to see the Venus-Mars-Spica shapeshifting triangle in the western twilight. Binoculars easily spot Spica and Mars in a light sky and make vivid their subtle bluish and rouge-gold hues respectively. After the trio sets in the west, look east to Jupiter rise around 9:00pm. Approximate Moonrises: 8:30pm, 9:00pm Rise/Set Times ~ Major Bodies Review the Sky Chart Above to see another sky view and to travel horizon to horizon! Luna, Jupiter and Uranus are located in Pisces, the constellation of the World Savior. See this 8/26 11:30pm Map and review the Sky Chart Above. The stars of this dim constellation can only be seen in a dark sky on a moonless night. It is interesting to note that Pisces, lies beneath the Great Square of Pegasus, which the ancient Babylonians called "The Doorway to Paradise." Today astronomers travel through this doorway or "window" to the edge of our Milky Way Galaxy and go beyond to other galaxies!. Likewise, the Doorway to Paradise opens and new dimensions of reality are experienced, when the Light of the World, the World Savior, frees humanity from subservience to the form, ending forever the darkness of matter. These celestial energies are reminding us of the Christ consciousness, humanity's essential divinity, the awakened heart and soul. Jupiter is brilliant and illuminating in this celestial position, for it is the brightest light in the morning sky and also in the evening sky after Venus sets. The giant planet is ultimately bound to be light for our world, expanding our hearts and minds. The call to humanitarian service is strong with Jupiter in Pisces. In this location Uranus also sheds its light upon our world by surprisingly shifting humanity into a new reality with new visions of the greater whole, freeing us from the outdated, limited form-life. Jupiter's easterly prograde motion brought it into conjunction with Uranus June 8 and now its westerly retrograde motion (7/23-11/17) is moving Jupiter back toward Uranus for an exact conjunction September 18. In addition, Jupiter and Uranus are both in a close approach to Earth, reaching opposition September 21. This portends a strong, joint planetary effect upon our lives. Expect surprises and sudden opportunities, as well as the feelings to express youthfulness and freedom. This lunar cycle reminds us to use these energies to foster the greater good, which dissolve differences. Too Hot? Find the Kool Winter Stars! Too hot? View the kool winter stars before dawn late in the summer and early fall. They are called the winter stars because they best seen on winter evenings, when they lie overhead. Note: Aldebaran rises at midnight, Betelgeuse around 1:45am, Sirius around 4:00am. The large dated spheres represent the waning Moon. The blue dot at the feet of Gemini near the 9/3 Moon represents the intersection of the ecliptic and the Milky Way. Keep reading! The Great Winter Hexagon and the heavenly equilateral Winter Triangle now appear in the morning sky 4:00am-sunrise. Some of the brightest stars in the heavens are located in this area of the sky. The Great Winter Hexagon is a heavenly geometry made up of stars that guide the way and expand the heart. The Lakota Sioux and other Plains Indians called this region of the Winter Hexagon the Sacred Hoop. It was considered to be extremely auspicious, when the Moon and Planets moved through the Hoop. On September 3 the waning Crescent Moon lies near the intersection of the horizontal ecliptic and the vertical Milky Way, the center of the cross formed within the Sacred Hoop (blue dot). Numerous myths and oral histories from Native American to Egyptian to Northern-European to Babylonian have referred to this intersection of the Milky Way with the Zodiac as the place where souls enter into incarnation, a gateway between the immortal and mortal realms, the Gate of Man. … an Alaskan shamanic tradition perceived the great equilateral triangle in the Hoop formed by Sirius, Procyon, and Betelgeuse, as a ‘heavens gate’, another version of an entry point or entrance into incarnation. See this article for THE SACRED HOOP. September 2, Thursday, the waning Crescent Moon rises around midnight and lies twixt the horns of Taurus the Bull. The horns of the Bull embody struggles that are age-old and evolutionary. During these times a multitude of global and personal struggles, desires and spiritual aspirations are tugging and pulling at us. Humanity often hangs on the horns of a dilemma having to make a difficult choice. Open to new visions and breakthroughs arising from our perseverance. September 3, Friday, the diminishing Moon rises by 1:15am followed by red Betelgeuse around 1:45am. Luna aligns with the Gate of Man, the portal between the immortal and mortal realms (see blue dot on above map), reminding us of our divine immortality. Betelgeuse stimulates humanitys heart center, the gateway to the soul. Imagine mortal beings awakening to their divinity and the truth that we are all part of one sacred hoop. Note: Mercury and the Sun are in inferior conjunction today. Mercury is also retrograde. Learn more. September 4, Saturday, the thinning Moon rises around 2:30am. It lies to the right (south) of Pollux in the constellation of the Gemini Twins. The cosmic Twins though opposites, Castor representing the form and Pollux the spirit, innately cooperate for the benefit of the whole. These aligned celestial bodies affirm that our present world of dualities and differences can offer opportunities of compassion and cooperation, which in turn lead to heartfelt expansions of consciousness. Imagine humanity with hearts ablaze dissolving differences and giving birth to the New Earth. Note: Look for the Venus, Spica and Mars shapeshifting triangle, as twilight deepens in the west. Learn more. This lunar cycle is ending. Continue to let go of any limiting beliefs that create separtation instead of unity. Allow compassion and cooperation to dissolve differences. Be reborn. Shine on Homo Luminous! September 8, Wednesday, a New Moon occurs at 3:30am PDT (10:30 UT). Stay tuned for the next edition of Moon Dances.